Yes. You read that right. Indiana has a wine trail. Indiana produces wines that are award-winning! This week is Thanksgiving Break, and I had some time to explore the wine country of Southern Central Indiana. Did you know that there are 72 local wineries throughout the entire state? About 25 wineries are located near and around Bloomington alone. The wine trail around Bloomington is called the Uplands Wine Trail. Two of my favorite wineries are 15 minutes away from Indiana University–Butler Winery and Oliver Winery. What I love about Butler is that it offers 6 free wine tastings per person–a great divergent for the budget conscious grad student. Their wines are highly drinkable, and are a great intro to wine for first-time wine drinkers. 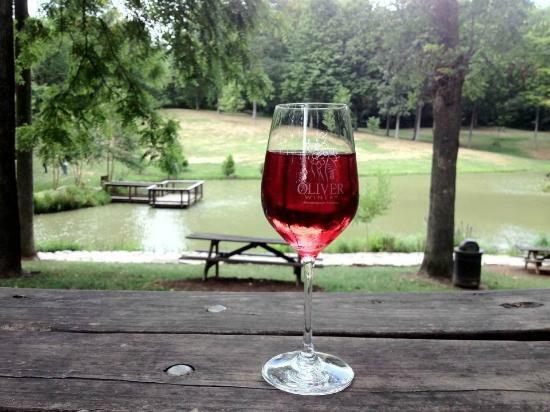 My other favorite winery is Oliver Winery, which is located on a major state road that leads up to Indianapolis. For $5, they offer 8 wine tastings per person. You can always split that cost with a friend as well. Their wines are nationally recognized and have won regional awards. What I like most about Oliver Winery is that they have an awesome deck, pond, and large lawn to bring a picnic lunch to accompany that bottle you just bought from the tasting. It is a great way to spend the afternoon, and some grad students study at Oliver when it’s a pretty day! Embrace your inner foodie! The local wineries are a must-do before graduating from Indiana University. This entry was posted in Stephanie N and tagged entertainment, food, fun, holidays, just for fun, spring break, winter break by admin. Bookmark the permalink.